Deodrants/anti-perspirants that DON'T stain clothes? Discussion in 'The Beauty Cupboard' started by Daniel_, Dec 24, 2009. So many of my favourite clothes are ruined with odd staining that I can only put down to deodrants/antiperspirants. I'm getting very fed up of this so would like some recommendations. I used to have the same problem. I used to use Secret gel deodorant and it used to turn all my white shirts yellow. I've started to use Dove powder deodorant. I think it works better and it seems a lot gentler than gel deodorants. I went from the powered bar to the roll-on applicator from Secret. It's the same thing but it just rolls on as a sort of light liquid. Not only did it make me sweat less, it didn't stain my clothing. So instead of buying the former, buy the latter. I use the one below and it works fine. The brand is Avon. I used to use men's deodorant, it was the one in the red package (old spice?) I liked the smell way more than women's deodorant, it worked better, and it never got any marks on my clothing! 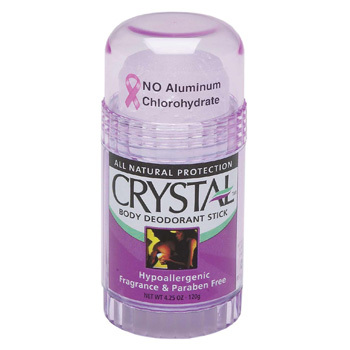 now I'm using a roll on deodorant called crystal, it's one of those natural deodorants, and it seems to be doing the trick. I agree with those who've said switch from a stick to a roll-on or something else if you're using a stick. When I lived in the UK I used nothing but roll-on and never had an issue with stains. The moment I went to North America, only stick deodorants were available and all my clothes developed these horrible yellow stains. Got new clothes, a bunch of roll-ons from the UK and never had the problem again. I use spray deodorants/antiperspirants. I've never used a stick or roll-on but will look to in future. Eurasian Mélange, yes I'm getting the strange yellow stains. And also some red dye ran from the armpit of the sleeves of a jumper I have which is annoying. It's almost as bad as when I used to use BP for my skin. Ridiculous!